The Monzo Android app has many of the features you’ve seen on iOS, designed and built natively for Android. We’ve tried to find the right mix of material and Monzo design and we’re really excited about being able to make a banking app that really fits on this platform. You can instantly freeze your card at any time, as soon as you realise you’ve lost it. If it was dropped down the back of the sofa, even better! Defrost it and keep using it within seconds. Whenever you want to add money to your Monzo card, it’s just a couple of taps to top up from any debit card. You can also set up regular standing orders at the beginning of the month to load your monthly budget and help you set a goal for the month. We’ve built our amazing live support chat into the app, so if you have any questions or issues, get in touch with us (without holding on the phone). As of this morning, our median response time over the last month was 9 minutes, which means you won’t be waiting long for a reply. We’re now working to bring that waiting time even lower and build up to full 24/7 support so you don’t wait, day or night! You can even request your PIN reminders in a specific artist’s style! You can also join in on our community forum within the app and discuss things like upcoming features and travelling with Monzo, see sneak peaks and meet the Monzo team. We’ve been working hard to send out more and more cards to people on our waiting list. The good news is that we’ve now got the wait for a card down to just 1–2 weeks; and, if you bring your friends along too, you can get it even sooner. Signup is open to anyone over 18 in the UK, so please join and claim your Monzo beta card! 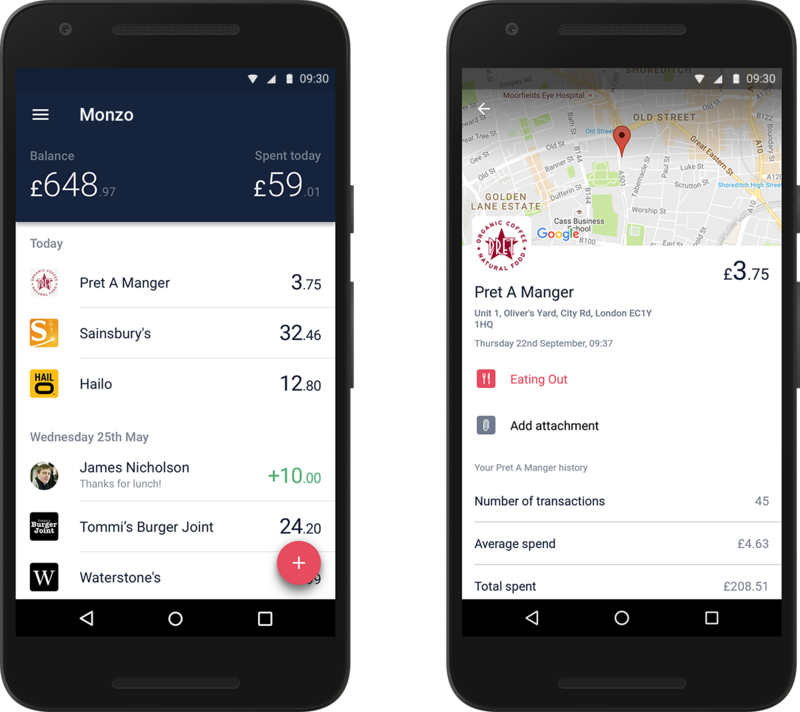 The Monzo Android app is still in its infancy and we’re so excited to bring more of the Monzo features you know to Android, as well as some powerful new features! Over the next six months, you can expect us to build in full spending breakdowns, budgeting support, sending money to friends, search and much more. We’ve updated our public roadmap with specific Android features so you can see when we’re planning to bring each feature to the app and we’d love to hear your thoughts over on the forum. We want your help in building Monzo on Android — your feedback, ideas and support mean that we can build the kind of bank you’d want to use. This is more true than ever on Android. Now we have our UK banking licence with restrictions, we’re pushing ahead to launch a free current account early next year, with a debit card, bank transfers and direct debits, as you’d expect and want from your bank. We are committed to bringing all of this (and more) to Android and working with you to make this the best banking app in the world. Thank you for your patience and support so far—we can’t wait for the next six months! A huge thank you to our three Android engineers, Emma, Ivan and Jonas, who have been working incredibly hard on this app. We hope you like it. If you have any questions, they’ll be doing a live Q&A at 5.30pm this evening on Periscope so come say hi!